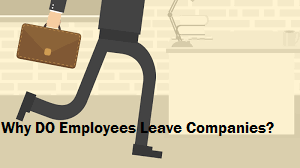 Home » »Unlabelled » Why DO Employees Leave Companies? We live in a world that is craving leadership on every level and we have so many who are in the corporate world that truly doesn't believe the leadership is there. Sure you're going to have the snowflake Millennials that complains about everything, but there are some things that are truly worth have a grievance about. There are times when people truly need to have a sit-down conversation with upper management and address some of the major issues they see going on in their workplace. When you lose an employee it's a difficult thing, because you have to train new people at a cost to you as the employer. If you're company or church does not have a solid clear mission people are going to be really confused and not want to give their all. Employees have to have 'buy in.' IF they are going to help your church or company grow. If the people in your church or company do not truly have a buy in to the vision/mission they won't stay, long term. They will come in for short while and then leave as soon as they see something that actually has a clear mission statement. People long and want vision. They want to see a clear direction and they will follow that direction if they truly see your leaders guiding them to get where you are wanting to go. I understand without money your company cannot run. But I will be honest if the employees that are making you money believe or perceive that you have more concern or desire for your healthy bottom line and don't truly care about them as people they are not going to stay. People love to feel and think that they are doing a good job. If you an employee is doing an awesome job at their job. TELL THEM ABOUT IT. One of the best ways to keep people to let them know you value them. I'm not talking about a trophy for everyone type of mentality. I'm talking about those who are really busting hump to make stuff happen! When men and women who are going above and beyond they should be recognized for it. And it does not have to be the same for everyone. Have a pizza day for the team that makes certain things happen. Extra vacation days employees that go above and beyond. Extra money is always a positive. Now I'm now saying that work has to be a circus, but when your people are having a good time, productivity increases. When people enjoy the environment that they are in they are going to want to be there. My dad is the city manager for the town we live in. His people show up early and stay late. They trip over each other to get the jobs done that need to be done. And they have a good time while they are there and the things that get done are amazing! Why? People are enjoying being at work. The tone is set by my father. He leads with fun. Now is he always fun, not at all. There are moments that business has to get done and he has to put his game face on. But he's humble in what he does. He shows grace where grace needs to be shown and empathy where empathy needs to shown. People struggle with Monday enough already. Create an environment where people are looking forward to coming in on Monday, not dreading it. Bottom line, people don't leave companies they leave managers and management. If you have management that has lack of vision and simply dictates and controls the environment, you are going to have high turn over. This is in any area of the world. Whether that be the corporate world or the church. You're not always going to be able to keep people around and you're not always going to be perfect in leading, but I think that if your people feel valued and your people believe in the mission they are more likely to stay connected.